If you’re looking to significantly reduce your electric and gas utility bills, and don’t want to shell out hundreds of thousands or millions of dollars for new HVAC and lighting equipment, then chances are you’ve considered Retro-Commissioning (RCx) – and if you haven’t, you should! With over a decade of experience providing energy efficiency consulting, I can safely say that Retro-Commissioning has consistently delivered the most cost-effective results for my clients, more so than any other service by far. In today’s post, I’ll explain why RCx could be a good investment for you, and provide the top five signs your building is ready for RCx. Utility bill energy cost savings resulting in project paybacks of less than 3 years. Unfortunately not all buildings make good RCx candidates. To find out if your building is a good candidate, there are a five simple signs that you as a building owner or operator can identify that will give a strong indication of whether or not RCx is right for you. Even if not all of the signs below are true for you, RCx MAY still be a good option. But if your building fits many or all five signs below, then I recommend you run as fast as you can to call your favorite RCx Provider. Ok this first one isn’t exactly a sign, so much as a pre-requisite, but it’s important nonetheless. In order for a professional RCx project to be worth your while, the resulting energy cost and maintenance savings must outweigh the amount you spend on consulting fees and other implementation costs. Preferably, your savings will vastly exceed your costs, and this is most often the case in larger buildings. The reason that larger buildings typically yield more cost-effective results is that there are costs associated with the RCx process (mobilization, data processing, reporting, etc.) that do not scale linearly based on the building size. Based on an LBNL study, industry average cost for RCx ranges from $0.05 to $0.50 per square foot (SF). That’s a HUGE range, and is attributed to many factors, not the least of which is the building size. RCx costs for a small building will likely be closer to $0.50 per SF, and the savings potential in those smaller buildings is lower due to lower overall energy consumption compared to larger buildings. Higher cost per SF, and lower savings potential, mean it’s much tougher to get a reasonable payback on a smaller building. While every building is different, and we have implemented successful RCx projects in buildings smaller than 50,000 square feet, as a general rule I’ve found that it is vastly more difficult to achieve cost-effective results in buildings of this size. The dentist says come in for a cleaning every 6 months, the doctor says come for your physical every year, the mechanic says to get a tune-up every 10,000 miles. Your building controls need regular check-ups as well. Based on industry standards, building HVAC and lighting controls can be expected to operate efficiently for 3 years on average without the need for a comprehensive system review. After that point, it is very likely that some systems are no longer functioning optimally and should be reviewed and corrected. Controls require periodic review because, unlike the Ronco Showtime Rotisserie, you cannot just ‘set it and forget it.’ Your building’s control systems, from simple pneumatic controls up to the most complex digital energy management systems, rely on explicit sequences of operations that tell your HVAC (and sometimes lighting) equipment how to respond to operational conditions. For example, your air-side economizer sequences may tell your HVAC system to open the outdoor air intake dampers whenever outside air temperature is less than the return air temperature, and dump the warmer return air to the outdoors to reduce the building’s cooling load. While the sequences themselves could theoretically stay in place indefinitely, those sequences require specific sensor inputs in order to function correctly. Those sensors include outdoor air temperature and return air temperature (and likely many more, if we really got into the details of the sequence). If either of those air temperature sensors falls out of calibration, or fails entirely, then the dampers may end up opening when they should be closed, or closing when they should be open. In either situation, the result would be increased energy consumption from the HVAC system, potential occupant comfort issues, and even safety issues if enough outdoor air is not being brought into the space at all times. A three-year check-up is not a hard and fast rule, in the same way that my fiancé who flosses every day can probably avoid going to the dentist as frequently as someone like me who flosses once in a blue moon. I’ve seen buildings that needed retro-commissioning mere months after they were built, since the original design and commissioning were done improperly. I’ve seen buildings that operate optimally for 5+ years – often because they have a good on-going commissioning program! But chances are if no one has done a comprehensive review of your controls in three years, and you let someone like me poke around, I’m going to find myriad opportunities for improvement. The primary goal of our retro-commissioning projects is to save money for our clients. The majority of cost savings come directly from reduced gas and electric energy consumption in the building. So, one of the biggest indicators that you could achieve significant on-bill energy cost savings is that your energy costs are increasing. This may sound obvious, but I’ve been surprised by the number of building owners or operators who do not have a firm grasp on their building’s energy consumption profile, and in particular, have not taken the time to assess how that usage has changed over time. So I encourage you to take a moment, review your energy bills from the last two or even three years, and see if you can identify any trends. The two key things to look for are what I call ‘drifts’ or ‘acute’ changes in energy consumption. Drift (or creep) is the gradual increase of energy usage over time. While some drift may be inevitable as the building ages, if you’re seeing steady increases of 10% or more in energy costs or consumption from year-to-year, then chances are you have operational issues that could be addressed by retro-commissioning. A drifting usage profile indicates that the accumulation of minor deficiencies in system operations may be stacking up over time to result in significant increases in costs. Here’s what a drifting building’s consumption profile may look like. An acute change is a more dramatic increase in energy consumption, which may then be followed by steady operation or further drift upward. These changes are often easier to spot as the increase in energy cost will be sharp and significant, typically drawing more attention than a steady upward drift. An acute change typically means that one or more of your highest energy-consuming pieces of equipment – say a chiller or main air handling unit – has suddenly started operating differently. The reasons for this change in operation may be very simple or may take significant effort to uncover. What should be eminently clear from the sharp increase in cost is that the issue should be addressed as soon as possible. The following graph provides an example of an acute increase in energy consumption for a sub-metered load in one of our client’s buildings. In this case, the dimming controls and overnight scheduling were modified, resulting in sharp increases in both daytime and nighttime energy consumption. Most buildings that meet the size criteria above have some form of energy management system (EMS) that is intended to automatically control HVAC systems and sometimes lighting systems as well. When the building is first built and commissioned, this control system should be efficiently and automatically controlling building operations, assuming your contractor and commissioning agent did their jobs well. But as time goes on systems degrade, heating coils get clogged, sensors lose calibration, and inevitably the building occupants start complaining about spaces being too hot, too cold, a bad smell, whatever the case may be. Your maintenance and operations staff is already spread thin on X,Y and Z issues, and nobody has time to do a deep dive into the root cause of these issues that crop up. So, when your tenant calls and angrily tells you that they have an important client meeting in a conference room and its 80 degrees in there, what do you do? You override that cooling damper to 100% to make damn sure that the room is cool, your tenant is happy, and most importantly, will stop calling so you can get on with the hundred other things on your to do list. The following screenshot is a prime example of a system operating with numerous operator overrides (highlighted purple) and, as a bonus, shows some faulty sensor data (highlighted orange), both of which indicate correctable issues with the hot water control system. 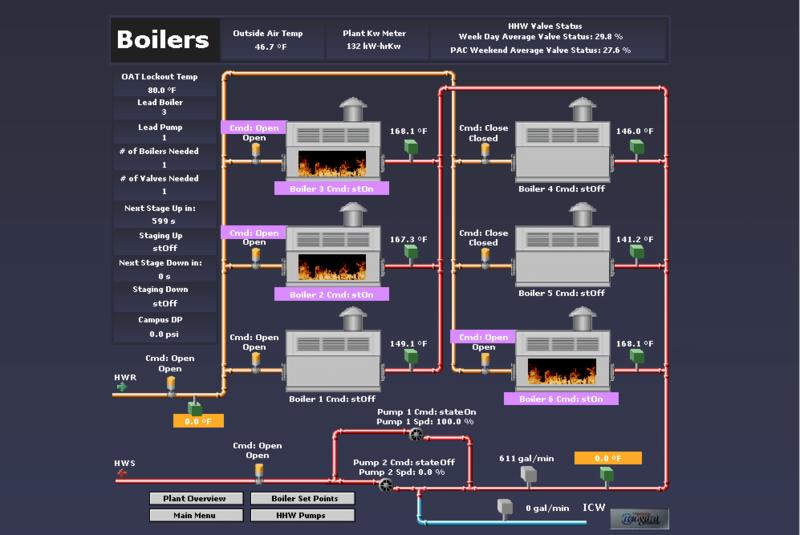 In fact, the faulty sensor data indicates one of the potential reasons that the automatic boiler staging is not working properly – these boilers are staged on and off to maintain a specific hot water supply temperature, but since that sensor isn’t reading properly, the automated staging cannot function. Even one operator override, if left unchecked, could wreak havoc on the control sequences that are intended to operate your systems efficiently, and as those overrides stack up, the likelihood that your systems are operating inefficiently continues to increase. Indeed, there is no way that your building will perform efficiently with operator overrides in place. So, if you see these overrides start to stack up, it’s a good bet that retro-commissioning is going to yield positive results for your bottom line. The goal of retro-commissioning is to improve the function of building systems and reduce energy consumption by adjusting control sequences, operational procedures, and maintenance practices, and without significant expenses to replace equipment. In order for this process to be successful, the existing equipment must at least have the capability of operating at or near its design conditions. But nothing lasts forever and even well-maintained equipment degrades over time. If the equipment itself is so degraded that it cannot perform its specified function, then there’s very little that can be done to improve operations. For example, if your HVAC system’s condensing unit is 30 years old, the coils are corroded and degraded, and even with the system running at 100% capacity you cannot maintain the refrigerant temperatures you need, then there may not be much if anything that can be done to improve that system’s performance. This equipment has exceeded its expected useful life (EUL), and your only recourse to improve comfort and efficiency is likely to replace the unit itself (and then have the new system properly commissioned by a qualified Commissioning Agent!). However, if your unit is 5-years old, it should still be physically capable of operating efficiently. But if it is not able to meet the space conditioning needs consistently, running harder than it should be, or otherwise not operating optimally, then a retro-commissioning professional may very well help you identify and correct the root cause of the system’s performance issue. The following table provides an at-a-glance summary of the EUL for typical equipment you may find in your building. If your systems are malfunctioning prior to the end of their useful life in the table below, then chances are your system performance can be improved by way of retro-commissioning. A more complete list of EULs, and the source for these estimates, can be found in the Database for Energy Efficiency Resources (DEER), developed and distributed by the California Public Utilities Commission (CPUC), and found here. So, if some or all of these indicators are true for your building, it’s a great time to look into retro-commissioning. If all goes well, you save money on your utility bill, improve occupant comfort, and enjoy a 1-3-year payback on your investment. Of course, if you need any help evaluating your RCx or energy savings potential, contact us anytime.